Micheal Chen from Middlesex University has won first prize in the prestigious Dyson Product Design Award for a responsive cycling jacket that changes color when braking or turning. As part of his award, he's bagging 5000 pounds! 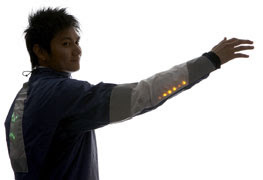 The Reactiv jacket uses an accelerometer to sense movement, changing the colour of LEDs on the back from green when accelerating, to red when braking. 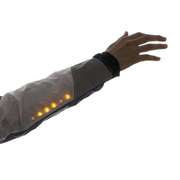 It has amber LEDs in the arms which are activated by a tilt switch behind the elbow. These light up when the arm is lifted, indicating the cyclist is about to turn. A tilt switch is basically an inclinometer that generates an artificial horizon and measures angular tilt with respect to the imaginary line. Chen says he was inspired by the working of the Nintendo Wii. Here's a video of how his jacket works. LED's draw very less current and are quite energy efficient (more light per wattage), requiring no more than 30-60 milliwatts for operation. Though these won't need replacement for quite some time, what happens if you DO need to replace one? Does the jacket have a cell based power source that you can toss out and have replaced? Anyway, James Dyson remarked : "Michael took a very real problem for cyclists -visibility - and has engineered a solution. Reactiv is a brilliant safety device, especially when cyclists can be so vulnerable. The use of arm movements to operate the tilt switches and LEDs is especially clever". According to the James Dyson Foundation website, British judges were impressed by the simplicity and effectiveness of Michael's design. A friend who volunteered to wear the jacket, was subjected to hours of iterations, masking tape and an achy arm, while Michael determined the ideal place for the switch. Note to Chen : Congratulations!! Your design is quite elegant and embodies the sound engineering principle of KISS - Keep It Simple Stupid. But we hope you do share some of that cash with your aching buddy. P.S : Sir James Dyson is a British industrial designer, inventor and entrepreneur famous for his Dual Cyclone Bagless Vaccum Cleaner with constant suction that often pops up in TV commercials. At one point, owning this baby was a status symbol. It cost upwards of 2000 dollars! Interesting concept and innovative solution....but I'd bet most of us rarely wear jackets. The only times I wear one is if it's rainy/foggy or near freezing. Although I do see a number of commuters wearing fluorescent yellow jackets in most any conditions who might find this jacket more appealing.